Creamy White Chicken Lasagna was originally posted in 2015. White Chicken Lasagna is an easy favorite meal. 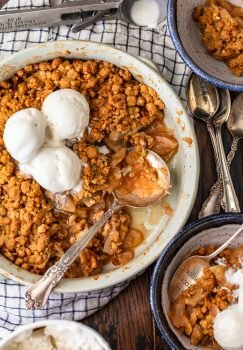 It’s packed with flavor and is surprisingly easy to make! This Caprese Chicken Lasagna is the ultimate comfort food, loaded with classic Caprese flavors like tomatoes and mozzarella. YUM! 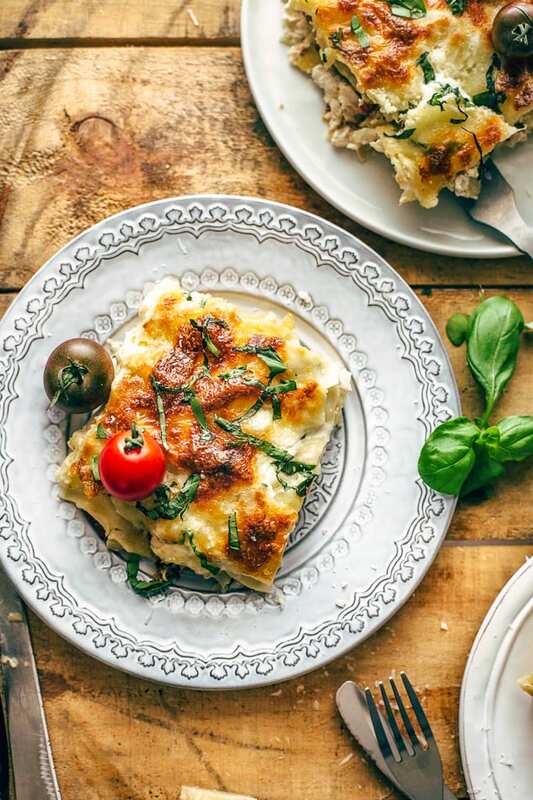 White Chicken Lasagna is one of my favorite versions of this Italian dish. Caprese Chicken Lasagna loaded with tomatoes, mozzarella, and basil! 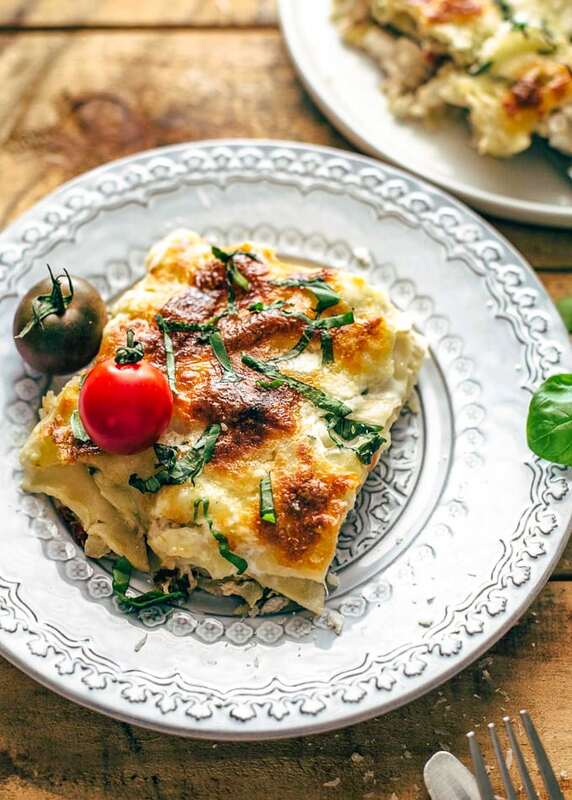 This White Chicken Lasagna is an absolute dream! Classic lasagna is delicious, but I really love this Caprese Chicken version even more. Substitute chicken for beef and add in plenty of mozzarella, tomatoes, and basil. 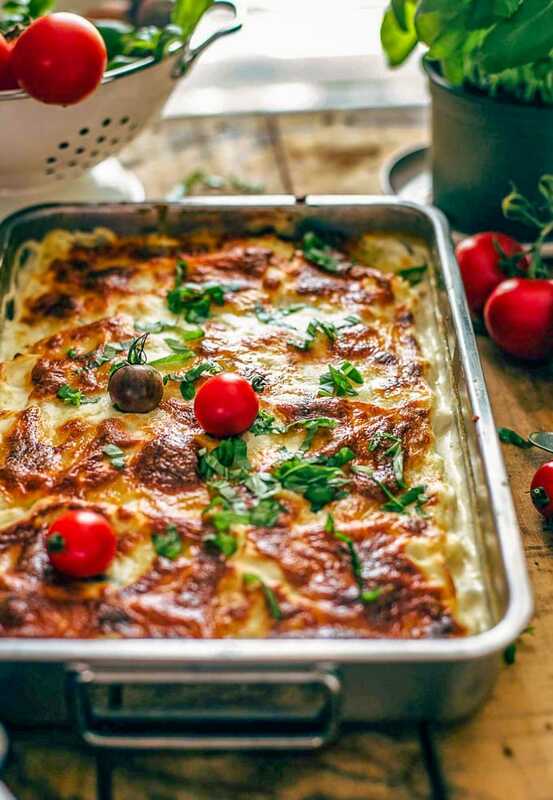 Try this white lasagna and you might never go back to the classic recipe! It’s no secret that I have a love affair with all things cheesy. Including my husband. He’s not quite cheesy enough for me…but sometimes he does giggle at the stupidest commercials, over and over again, and I love that. But apart from him, I just love love love CHEESE. It’s not good for any type of diet, but it sure is delicious, and that’s enough for me! I believe most recipes should be a little cheesy, and this cheesy white chicken lasagna is just that! 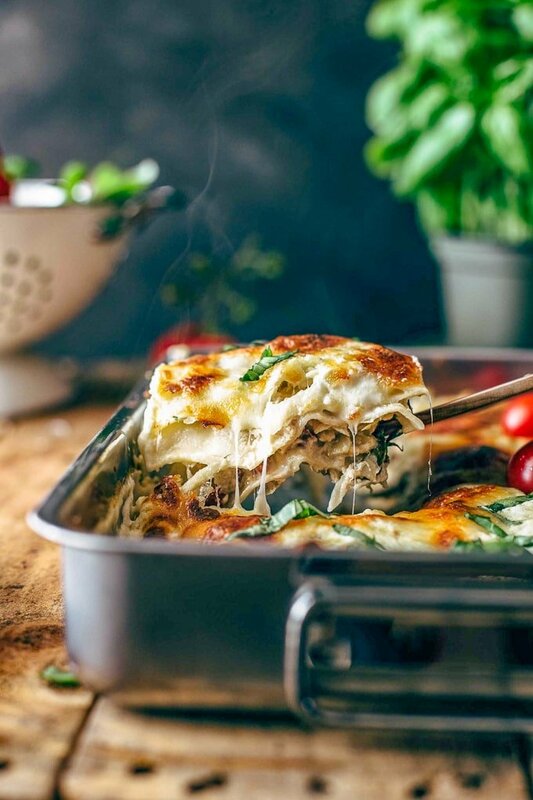 Make this easy Caprese Lasagna for an amazing weeknight dinner and you will be in love. It’s also great to save for leftovers, and reheating is super simple. 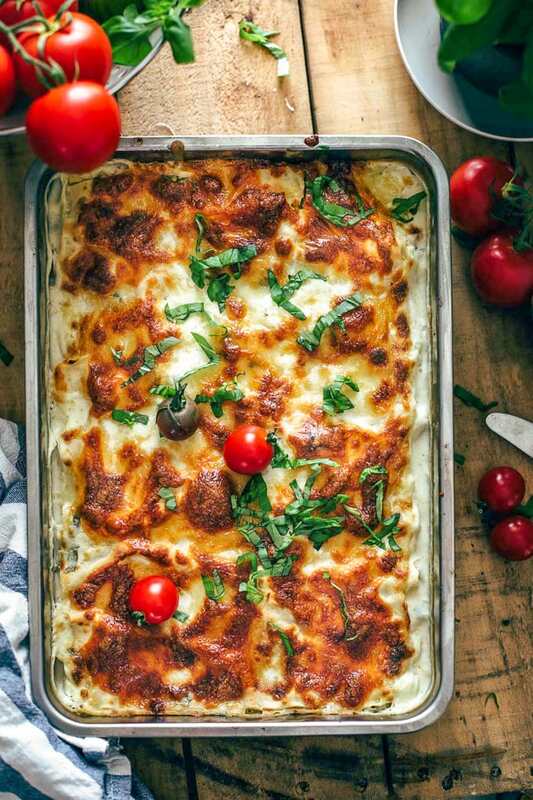 This Caprese Chicken Lasagna is filled with chicken, mozzarella, tomatoes, and topped with a creamy white sauce. Yum! If you guys didn’t know by now, I’ll fill you in: I’m obsessed with Caprese anything. A classic Caprese salad is made up of mozzarella, tomatoes, and basil, and it’s one of the best things in the world. Now I use that flavor combination in so many different recipes, and it never disappoints! Where there’s cheese, there should be basil, and, preferably, some tomatoes. It doesn’t matter what type of tomatoes, but they always go well with cheese and fresh basil. Sun-dried tomatoes, roma tomatoes, cherry tomatoes…Any tomato will work. 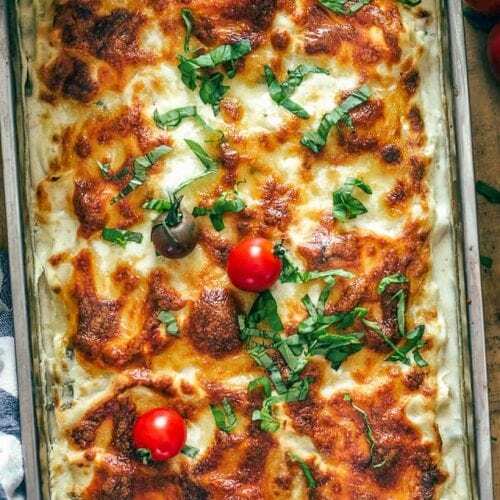 This Caprese Chicken Lasagna has it all and it’s so delicious! 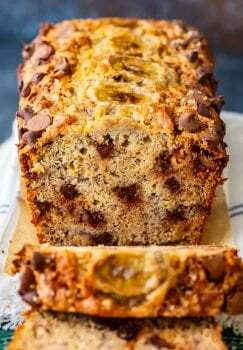 A recipe like this is so good because of the amazing ingredients! 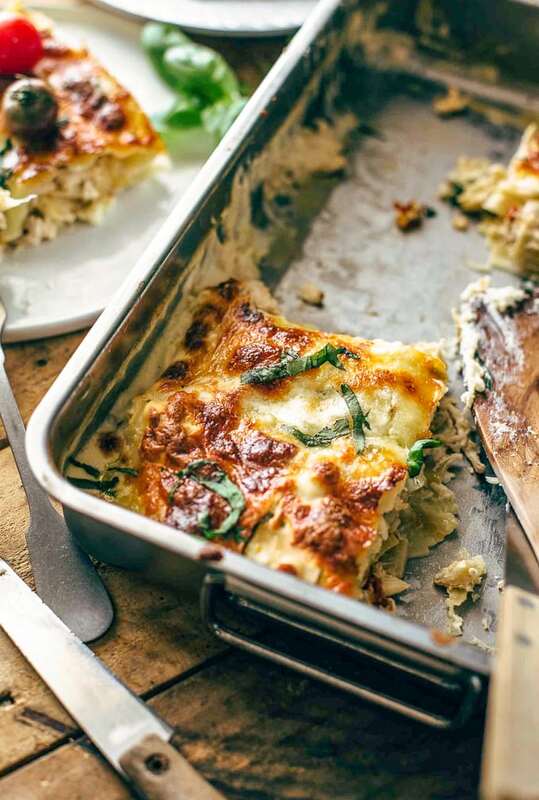 I love this white chicken lasagna recipe because it’s filled with my favorite things. All of these ingredients combine to make the creamiest, cheesiest, most delicious lasagna recipe ever! You know I wouldn’t be making this white chicken lasagna if it weren’t easy. The more I cook, the more I realize how simple a lot of recipes are once you organize everything into steps and just take it one step at a time. 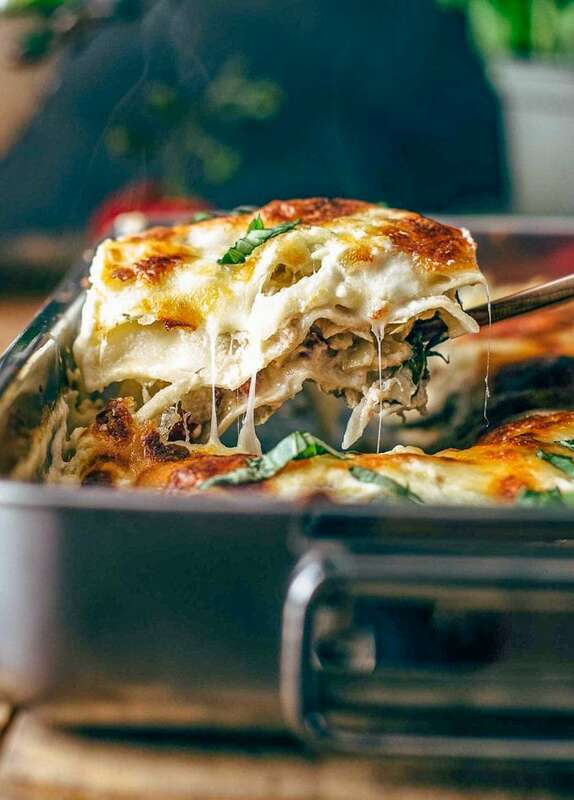 This white lasagna recipe is easy to follow, so make it for yourself and see how amazing it is! In another bowl, use an electric mixer to beat cream cheese, half and half, garlic, and salt & pepper. Then use a spoon to stir in the basil. 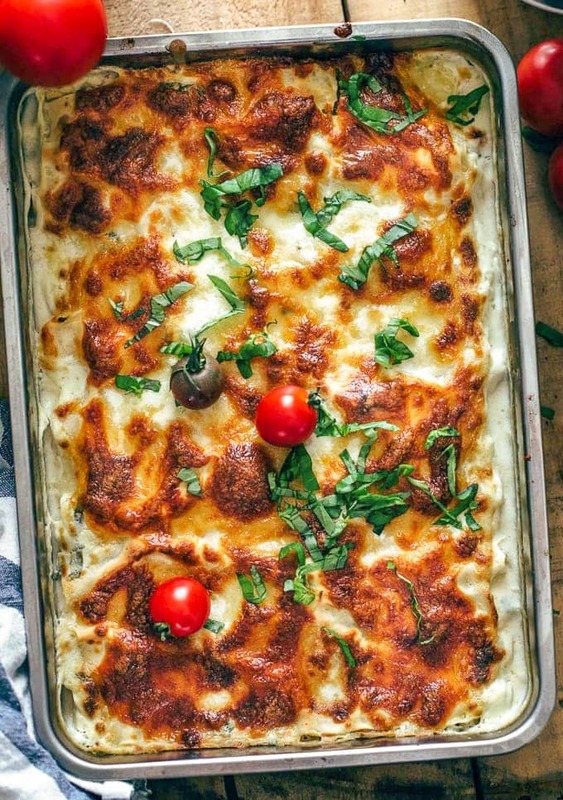 This white chicken lasagna will come out hot, cheesy, and delicious! You can store leftovers in the refrigerator for up to a few days and reheat in the oven. I adapted this Creamy White Chicken Caprese Lasagna recipe from one I found on Pinterest, and I’m SO glad I found it. I made a few changes, but it’s been one of my favorite lasagna recipes to date! Watch the video or see the recipe card for details on how to make White Chicken Caprese Lasagna. Enjoy! White Chicken Lasagna is an easy favorite meal. It's packed with flavor and is surprisingly easy to make! This Caprese Chicken Lasagna is the ultimate comfort food, loaded with classic Caprese flavors like tomatoes and mozzarella. In a large bowl, combine chicken, artichokes, 1 cup mozzarella, grated parmesan, 1/2 the basil and tomatoes. Set aside. In a separate bowl using an electric mixer, beat cream cheese, half and half, garlic, and salt and pepper to taste until well combined. Using a spoon, stir in half the basil. Set half of the cream cheese mixture aside and stir the remaining half in with the chicken mixture. Take half of the cream cheese mixture (half of the part without the chicken) and spread it into a 9x13 baking dish, covering the bottom. Lay 3 noodles on top and then top with 1/3 of the chicken mixture. Repeat the noodles and chicken mixture two more times, ending with a noodle layer. Top with the last half of the cream cheese mixture. Place the whole milk mozzarella slices on top in rows of three, like shown. Sprinkle the shredded mozzarella over everything, and then top with more basil if desired. This looks amazing….we love cheese and cannot wait to make this recipe. Thank You. This is in my oven right now…. it smells delicious and I can’t wait to try it! Hi Asre, you can email any questions to thecookierookie@outlook.com. Glad you love the recipe! This was SO delicious. I used kraft italiano mixed cheese instead of plain mozzarella cheese and didnt have any artichokes so I left that out. My friend also loved it; definitely a recipe I’d make again!! 1) I have sun dried tomatoes in oil;will that be ok to use as long as I drain them really well? 2) How much cream cheese? Just like an 9 oz package? And 1 and a half of those? This looks amazing and I don’t want to screw it up! And I agree, cheese makes everything better! Hey Carissa, I hope you love the recipe!! Yes you can use the sun dried tomatoes in the oil FOR SURE!!! Just drain them like you said, they’ll be delicious :) And you’re right on the cream cheese, exactly! Thanks for stopping by, let me know how you like it! LOVED the recipe! My Mom said it was the best lasagna she has ever had! A keeper for sure! I didn’t put in the artichoke hearts since I don’t like them and added more cheese, cause who doesn’t like cheese?? And I drained and rinsed the tomatoes so they wouldn’t be really oily and cut them in half and they were perfect!! Thanks again for this awesome recipe!!! yay!!! So glad to hear that!! More cheese is my mantra :) Thanks for letting me know that you liked it!! Do you think this would freeze well, I’m stocking up my freezer this week! I’ve never frozen it, but I do think it would freeze well! Other lasagnas I have made have done really well frozen. If you try it, let me know! I definitely think it would be convenient to freeze this in the future! I’m adapting it to use as a freezer meal recipe. When I saw it I knew I had to have it on my meal prep list. That is awesome Alora!! Hope you love love it! Wow! Came over from yumgoggle.com This looks amazingly cheesy! I’m going to have to try it! Thanks Holli! Hope you love it! Great recipe this, one of my favorites. thanks for sharing. I’m so happy to hear that! Thanks for stopping by and letting me know! Oh Lawd, Sister! This looks DIVINE!!! Oh the possiblities.. a layer of spinach and mushrooms. You may have inspired a cheese coma on the ranch today! Can I replace articokes with something else? You could leave them out all-together or replace them with whatever veggies you like. Hope you love the recipe! Spinach or mushrooms would be good! I made this tonight. So good! Even my picky son liked it (though he picked around the artichokes – but hey, he ate it!). Definitely adding this to the recipe file. I’m so glad!! And yeah, I hated artichokes as a kid too :) Thanks for stopping by and letting me know, made my day!